Hi everyone! Laurie here with a fun Christmas card today. I'm really into plaid paper this year, and have quite a collection going....I used a piece I just love to start out this card. Then I cut out the Tutti Fir Tree Arch in white, and adhered it on a piece of snowy paper for the background. I also cut it out in red, and used the red stars to inlay onto the white. I put a red enamel dot on one of the snowflakes too. 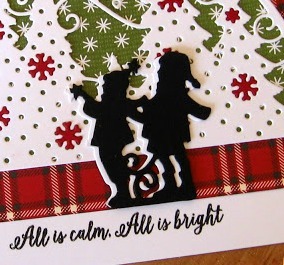 I really love these type of arched dies...they are so pretty and fun to make cards with! I took another one, called Deck the Tree, and cut it out in white and black. Then I cut just the kids off and adhered them onto the Fir Tree arch. Then I stamped the sentiment in black.